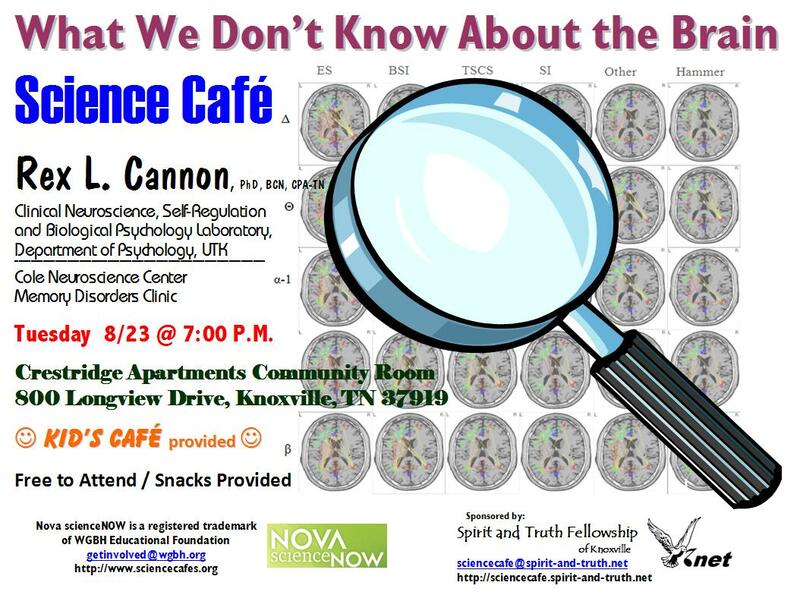 Spirit and Truth Fellowship is the proud sponsor of an ongoing Science Café for the Knoxville, Tennessee area. This is an event encouraged by the Science Unit of WGBH Boston, which produces the popular program NOVA scienceNOW for public television. During these meetings, discussion will be restricted to topics of science only. Religious viewpoints shall not be presented. Within the context of the Science Café, Spirit and Truth Fellowship does not advocate religion. Topic: "What We Don't Know About the Brain"
Date: Tuesday, August 23, 2011 at 7:00 P.M. Please make plans to attend! If you have any questions, we have a special e-mail address set up, sciencecafe@spirit-and-truth.net.